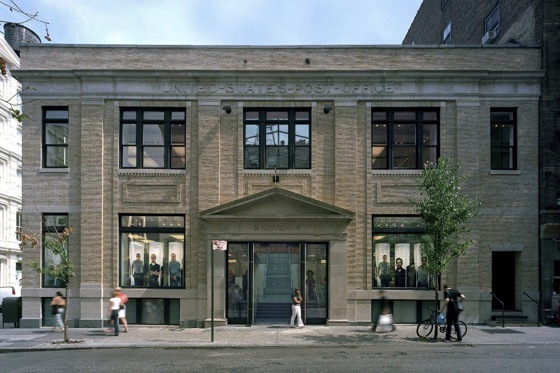 Apple closed the Apple Store SoHo, New York City's first Apple Retail Store, late last year for a renovation and expansion into the space formerly occupied by a United States Post Office. SoHo has grown significantly, gaining sales space for twice as many products, a new theater with extra seating for special events and workshops, NYC's first business-focused Briefing Room, and a much larger Genius Bar. The store, located at 103 Prince Street, will reopen Saturday, July 14th at 9AM. The first 3,000 visitors will receive commemorative t-shirts. I only read articles I am interested in. I couldn't give a hoot about an Apple shop in New York. The idea of an Apple shop in Soho in London was interesting. I wouldn't have looked at the article if the title wasn't misleading. Protip : There is more to the world than America. The fact that the title didn't mention New York doesn't make it misleading, because New York does in fact contain the store to which the article refers. And while you might prefer that the title provide additional information, it does contain a fairly obvious clue -- the "H" in "SoHo" is capitalized. That capitalization is obligatory when referring to the New York neighborhood and discouraged when referring to the London neighborhood. In addition, this site previously has reported on the Temporary closing of the SoHo Apple Store, so a reference to the "reopening" provides an additional clue to regular MacRumors readers. Your statement that "[t]here is more to the world than America" is rather misplaced since it is you who was arguing that an Apple Store in Soho (London) would have been "interesting," thereby implying that an Apple Store in SoHo (New York) was not. Perhaps you would do well to remember that there is more to the world than the U.K.
Can this news article be changed to specify that it is Soho, New York, USA. Apple closed the Apple Store SoHo (http://www.apple.com/retail/soho/), New York City's first Apple Retail Store, late last year (https://www.macrumors.com/2011/11/01/temporary-soho-retail-store-showcases-rustic-look/) for a renovation and expansion into the space formerly occupied by a United States Post Office. SoHo has grown significantly, gaining sales space for twice as many products, a new theater with extra seating for special events and workshops, NYC's first business-focused Briefing Room (http://www.macstories.net/news/inside-an-apple-stores-briefing-room/), and a much larger Genius Bar. Hmmm nothing. It isn't in the title of the article or the thread. so are you too illiterate to read the article? Im not going in there. Look at the windows - the staff are MASSIVE!! oh yeah-- totally! I remember when the Grand Central store opened and I completely thought they were talking about Grand Central in Munich Germany!!! OK. So you missed the 2 New York references. Please tell me where a "United States Post Office" exists in London. Just in time for Mercury to enter retrograde. My astrologer is predicting trouble for this location for at least a month.